Tuesday, May 5 at 7:30 p.m. ~ Choir rehearsal in St. Charles Hall. Thursday, May 7 at 8:00 p.m. ~ Bingo will be played in St. Charles Hall. Saturday, May 9 from 9:30 a.m. to 12 Noon ~ Helping Hands Food Pantry in St. Charles Hall. Saturday, May 2 9 at 8:00 p.m. ~ Bingo will be played in St. Charles Hall. 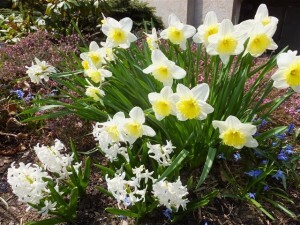 Sunday, May 10 following 10:00 a.m. Mass ~ Mother’s Day Breakfast in St. Charles Hall (Reservations required). 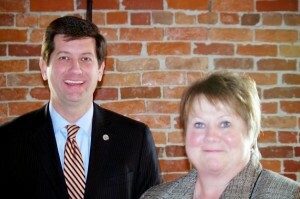 Monday, May 4 ~ Communion Service at 11:00 a.m.
Paula Hunt, pictured here with County Executive Mark Poloncarz when she received her “Unsung Hero Award” at the Homeless Alliance Luncheon in February. Giving Back to Paula is the name of a benefit for Paula Heinz Hunt taking place on Sunday, May 3, from 1:00-5:00 p.m. at the Main-Transit Fire Hall, 6777 Main Street in Williamsville. Paula is being treated for Stage 3 skin cancer and has been unable to work for almost a year. We at Blessed Trinity know Paula best for all the work she does on behalf of Family Promise. A “true giver,” she has left footprints on the hearts of family members, friends and strangers too numerous to count. Paula is a loving wife, sister, aunt and friend, as well as a tireless advocate for the homeless, the poor, teenagers and young adults through her work at Family Promise of WNY, Ss. Columba-Brigid Parish and Rediscover Riverside. If you are unable to attend Sunday’s benefit but would like to help, consider a check in any amount, payable to Paula Hunt. Amy Johnson will be happy to accept your donation and see to it that Paula receives it. 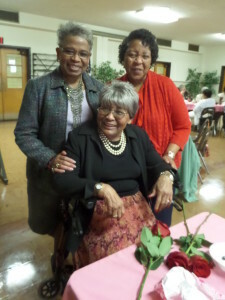 Women of the Parish ~ You are invited, as guests of the Holy Name Society, to our traditional Mother’s Day Breakfast to be held on Sunday, May 10, following the 10:00 a.m. Mass. Reservations for the breakfast are necessary and may be made by calling the Rectory Office at 833-0301. The reservation deadline is Wednesday, May 6. Non-parishioner adult guests, such as daughters, mothers, sisters, similar-in-laws, etc. are welcome. No children, please. Cost for a guest is $5 per person, payable at the door. Attention Prayer Partners ~ Your Pot Luck Supper is scheduled for Thursday, May 7, at 5:30 p.m. at Ss. Columba Brigid Church. If you did not sign up but wish to attend, please call Sister Maureen Harris at 892-2471 no later than Monday, May 3. 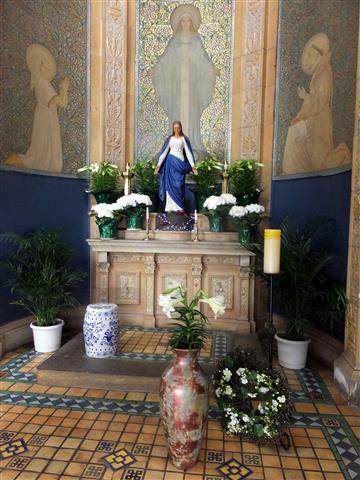 Call for Volunteers ~ On the weekend of May 16-17, 2015, Blessed Trinity will participate in the New York Landmarks Conservancy’s Fifth Annual Sacred Sites Open House weekend. We will join dozens of houses of worship all over the state showcasing their landmark buildings. It’s an opportunity to highlight BT as a perfect example of art preserved by faith and faith preserved in art. WE NEED VOLUNTEERS!! The Open House will take place on Saturday, May 16 from 2:00 to 4:00 p.m. (before 4:30 Mass), and on Sunday, May 17 from 12:00 noon (after 10:00 Mass) to 2:00 p.m. We will need docents, greeters, sellers, and general hosts. If you have worked any of our Open Houses in the past, you know everything you need to do. If you are new to Open House tours, we will happily train you. If you can help on either of these two days, please fill out one of the forms on the Communion rail indicating what type of role you are willing to play and which date/time you are available. Place the completed form in the basket. Judy Casassa will contact you with confirmation of your assignment. Please sign up to participate by Sunday, May 3. Thank you! Congratulations and Thank You, Lorena ~ This year Lorena James has been participating in the Confirmation program at St. Joseph University Church, where she was confirmed on Monday, April 27th. We pray that the love, joy and peace that the Holy Spirit bestows will be alive in you always! And we thank you, Lorena, for the wonderful presentation on your trip to China that you shared we us at the April 26th coffee hour. The photographs were beautiful and your explanations and impressions of the experience were exceptional. And — you were a “Pro” in responding to all the questions. It was a very special treat for all of us. We also thank your mother, Cathy, and your brother, Miles, for the help and support that made this all possible. Final Trinity Series Concert on May 24 ~ There is just one concert remaining in our 2014-15 Trinity Series. Reflections on a Dance brings the concert season to a resounding close as our resident musical ensemble, the Buffalo Brass Choir, under the direction of Nick DelBello, performs music inspired by the dance. Their repertoire will include Brahms’ Hungarian Dances, Ginastera’s Dances from Estancia and David Sampson’s imaginative Reflections on a Dance. 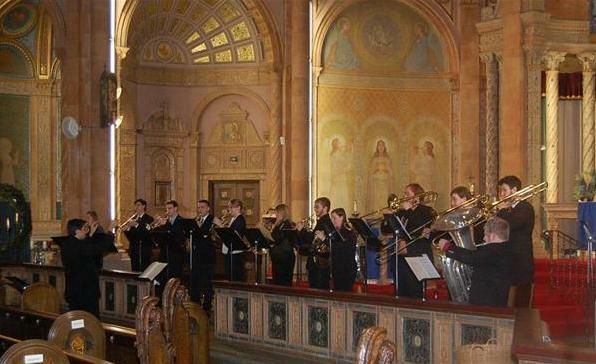 And here’s a tip for those of you who enjoyed the resonance of the Camerata’s string ensemble in our sanctuary: you’re going to be blown away by the Buffalo Brass Choir — and on Pentecost Sunday, no less! Please plan to be with us on Sunday, May 24, at 3:00 p.m.
Watch us on PBS ~ Blessed Trinity was featured Sunday, April 19, on the PBS program, “Religion & Ethics NewsWeekly.” The half-hour show was produced in Washington, DC by the Public Broadcasting System and broadcast locally at 12:30 p.m. on WNED-TV. Click HERE to watch the segment on the Buffalo Mass Mob filmed at our church on March 22, 2015. It is also possible to view photos from Mass Mob IX at Blessed Trinity and a companion TV segment with WGRZ’s Ron Plants by visiting the Buffalo Mass Mob’s Facebook page. Just click HERE to be connected. Respite for Grandmothers Raising Grandchildren ~ The weekend of June 5-7 is a chance for low-income grandmothers who are raising their grandchildren to enjoy a little break. This respite weekend will be held at the Center of Renewal on the Stella Niagara campus in Lewiston. The weekend includes a modest room, meals, optional activities and an opportunity to rest. You’ll also have a chance to meet other grandmothers in WNY who are also raising their grandchildren. The cost is free, but a $15.00 donation would be appreciated. To apply you must complete an application form, a health form and have a referral from an agency or faith based organization or counselor. The deadline is May 21, 2015. For more info and applications call 893-0931 or Sr. Maureen Harris at 897-9948 x114. 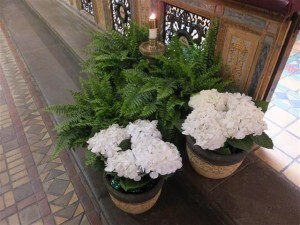 Easter Water ~ Vials of Blessed Easter Water are still available to you in the basket on the altar railing near the Baptismal Font. Summer Programs for Children ~ We are beginning to receive information regarding area summer opportunities for children. Materials will be displayed on the table in the front vestibule. garden on the east side of the church. Boys & Girls Summer Basketball Camps ~ Hilbert College is offering summer basketball camps for boys (June 28-July 2 & July 12-16) and girls (July 5-9). Registration/check-ins take place on Sundays between 2:30-4 p.m. and camps conclude on Thursdays at 3 p.m. Campers are given the choice of staying on campus (resident camper) in air conditioned Trinity Hall or commuting (day camper). The camps run from 9 a.m.- 9 p.m. weekly. All meals are included in the cost. To download a free brochure, go to http://www.hilberthawks.com and click on “Events.” For more information, contact Rob deGrandpre at 716-926-8803 or rdegrandpre [at] hilbert [dot] edu (Boys) or Melissa Graham at 716-697-8946 or mgraham [at] hilbert [dot] edu (Girls). Catholic Charities Offers a Gathering Place ~ The Adult Day Program located in the city of Buffalo, NY near the historic Broadway Market has been in existence since 1973 and was the first social adult day center in upstate New York. Currently there are between 35-40 participants, with an average daily census of between 12 and 18. The program operates Monday through Friday from 8:30 a.m. until 4:00 p.m. Its staffing ratio ranges from 5:1 to 6:1. Some of the unique activities offered include: Tai Chi classes (Falls Prevention), inter-generational programming (collaborations with Buffalo Schools), creative and expressive arts, music and movement. Please call 896-6388, ext. 212, to arrange a visit for lunch and a tour.